The Jesuit community in Fordham, New York set out to establish a church and school in Manhattan in 1847. 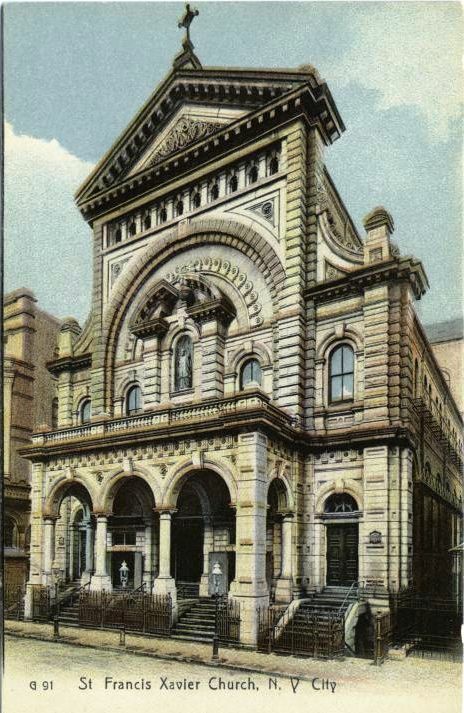 Before long they had acquired land between 16th and 15th Streets and constructed a classic-style, unimposing church. As the parish grew larger, it strained the limits of the structure. It was here, on the evening of March 9, 1877, that tragedy struck. While Father Langlacke was preaching “on hell and the horrors of the damned; and as the preacher was picturing the torments of purgatory, a young woman in the corner gallery, overcome by her feelings, fainted, and gave utterance to a hysterical scream, starting the worshippers, and causing them to spring to their feet,” according to a local newspaper. In the confusion, someone yelled that a fire had broken out in the gallery. The parishioners stampeded towards the doors. A “very stout woman” fell at the bend in the stairway from the gallery and before she could recover, the panicked women behind her trampled over her and the others who fell. In the end, seven women died in the frenzy. A year later plans were drawn up for a new, magnificent church. Irish-born architect Patrick Charles Keely, who would design hundreds of church buildings before the end of his career, was given the commission. 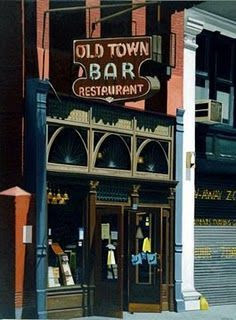 His church would be like nothing ever seen in Greenwich Village. Completed in 1882, the gray granite structure dwarfed everything in the neighborhood. The AIA Guide to New York City says, “The monumental porch of this neo-Baroque church spills onto the sidewalk.” The façade rises, in rough-cut blocks, high above the sidewalk in lofty stateliness. “Inside is an equally monumental Baroque space,” says the AIA Guide. The interior spills over with European-style ornamentation: frescos, carved plaster and stone, arches, niches, inlaid marble; a frenzy of ecclesiastical decoration. It was declared “sumptuous and exhilarating” by The New York Tribune. Eventually the magnificent structure was paid for. On March of 1947, a painting of Saint Francis Xavier which had hung in the Immaculate Church in Nagasaki, Japan and miraculously survived the atomic bomb that obliterated the city was presented to the Church of St. Francis Xavier. 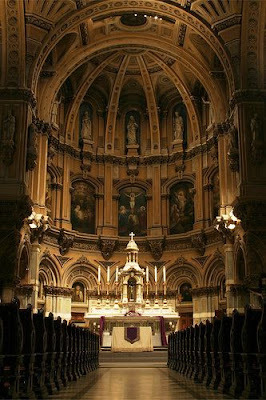 In 2005 the parish initiated a $6 million restoration. 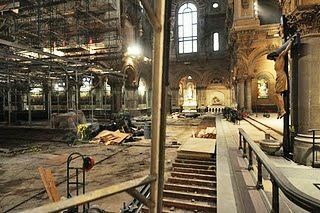 The interior was essentially gutted to replace flooring, restore the pews, upgrade mechanical and electrical systems, lighting and plaster repair and cleaning. Outside a complete restoration was completed including the replacement of up to five percent of the granite façade, where damage was beyond repair. 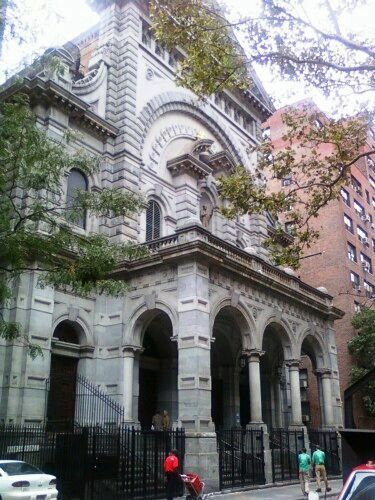 The majestic church was rededicated on June 19, 2010; an unexpected masterwork on a tiny side street of Greenwich Village worth discovering on a weekend stroll. Around the time of the Civil War an ordinary stables was built at 57 Great Jones Street. It was the type of business that would characteristically board horses and rent small carriages to locals who could not afford or had no regular need for one of their own. It was a common two story red brick structure with a modest cornice, two brick-arched windows flanking an arched hay loft opening, and a centered, double wooden door for carriage access. 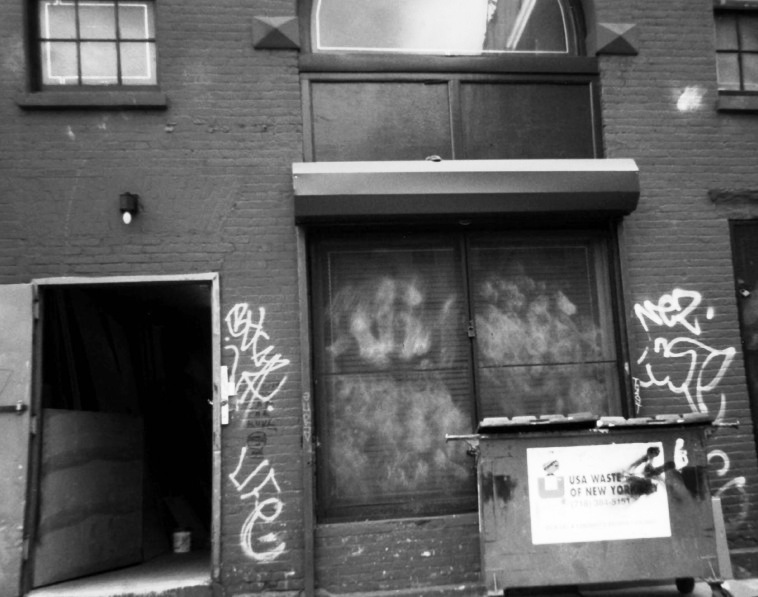 There was nothing exceptional about the building at 57 Great Jones Street. In an early example of architectural recycling in a city known for tearing down its buildings, the stables had been converted to a saloon and dance hall by the turn of the century. Called “The Brighton,” it was owned by Charles Deveniude. On January 12, 1901 Deveniude’s saloon -- and his life -- nearly came to an end. Deliverymen from a local brewery had packed the cellar with barrels of beer. One of the barrels fell against a gas jet, breaking it off and causing the cellar to fill with natural gas. When Deveniude descended with a lighted candle to check on the new inventory, the gas ignited. According to The New York Times, “The report of the explosion was heard several blocks away. Some wooden platforms used to cover the grating in the sidewalk were hurled across the street, and a sheet of flame came up the stairway to the street.” Deveniude was burned about the hands, face and shoulders and damage to the building was estimated at $500. Deveniude made repairs and continued business, but by 1905 he had sold out to Paul A. Kelly who ran the saloon-dance hall as “Little Naples,” a notorious hangout for an Italian gang connected with Tammany Hall. Excise arrests, for selling alcohol beyond legal hours or on Sunday, were common and the saloon was “closely watched by the police” according to The Times. Ratta was wrong. Two nights later he was murdered. Kelly, whose real name was Paulo Antonio Vaccarelli, was later called by The New York Times “perhaps the most influential gangster in New York history.” His gang was highly involved in bringing “floaters” into the city from New Jersey and lodging them at The Mills House #1 on Bleecker Street. Floaters were illegal voters who were paid to vote for the Tammany candidates, flooding the ballot boxes. A few days after the Ratta shooting, William E. Harrington was in Little Naples. Word had gotten out that he was poised to inform police about the floaters. Harrington never made it out of the saloon alive. Although he apparently fought valiantly, his body was riddled with high caliber bullets. The Harrington murder trial was held four years later. Although Kelly was not implicated, he closed Little Naples and opened a Broadway district gambling house. For decades 57 Jones Street saw minor business come and go. Then artist Andy Warhole purchased the building. 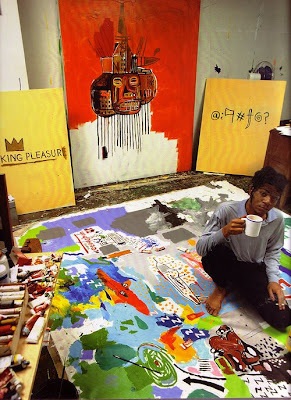 After renovating it into an artist studio and living space, he rented it in 1983 to neo-expressionist artist Jean-Michel Basquiat. Basquiat threw memorable parties here hosting artists and celebrities such as Keith Haring, Julian Schnabel, and Madonna. The artist’s fame and success, however, would eventually kill him. In 2009 57 Great Jones became home to Bohemian; a sleek, trendy Japanese restaurant hidden behind Japanese Premium Beef, a retail meat outlet. In the room where mobsters were murdered and an artist drugged himself to death, connoisseurs now pay $50 a pound for steaks. 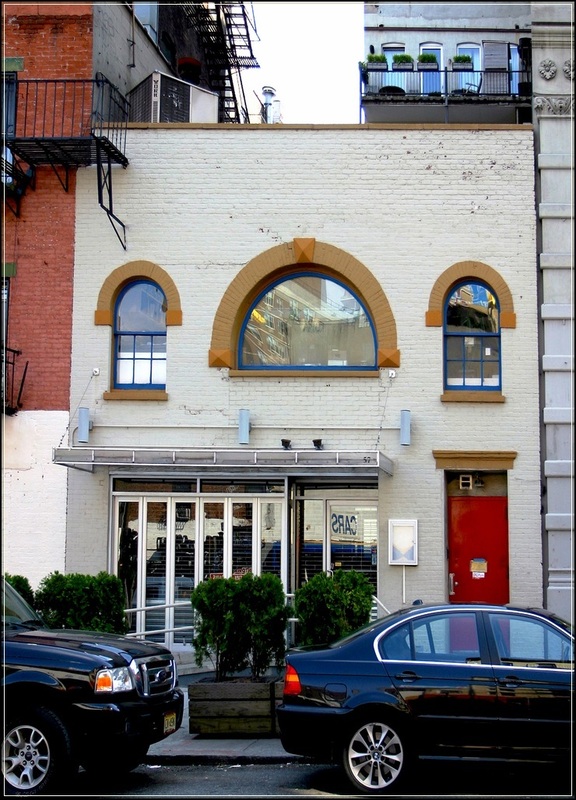 57 Great Jones street is a totally unexceptional building with a remarkably exceptional history. Nine-year old Peter Cooper, in 1800, had already learned the basics of several trades – beer brewing, hat making, and carpentry. What he had not learned was correct spelling and formal arithmetic. The son of a working man, he had only one year of schooling. While Cooper had no formal education, he would go on to greatness. Yet his lack of education would always haunt him. That year the young Peter Cooper was working as an carriage-maker’s apprentice. He exhibited an amazing skill and innovativeness. To sharpen his innate talents the boy sought an accessible school where he could learn scientific techniques, geometry, and theory. There was no such institution. Cooper would go on to design and build the first steam railroad engine in the country, open a glue factory and an iron foundry, invent powdered gelatin (which, when his wife added fruit for flavor became known as Jello) and increased his growing fortune through real estate, insurance, the new telegraph, and railroading. By the middle of the 19th Century, Cooper was one of the most successful and wealthiest men in the country. Yet he suffered a nagging self-consciousness over his lack of education. To provide the means by which other lower-class children could receive an education, he conceived of a free teaching institution based on the concept of a polytechnic school in Paris. Education should be, he said "as free as water and air." He set about planning a school for the "boys and girls of this city, who had no better opportunity than I." 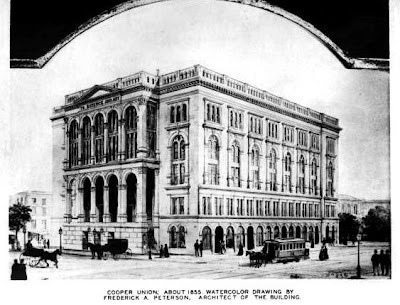 Cooper used his own innovations in the construction of the Union. He used rolled, wrought-iron beams from his foundry, arranged in a light grid, to support the floors. By utilizing thinner piers than the customary heavy stone arches, he increased the usable space of the lower levels, including the main hall. Even before the building was completed the Great Hall was used for speeches, rallies and lectures. Rental from the public spaces was intended to contribute heavily to the operation of the school. 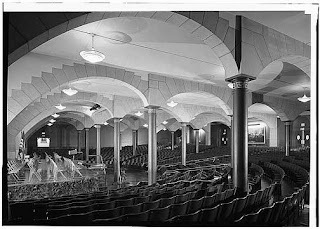 The 900-seat space would soon see reformers and politicians like Henry Ward Beecher, William Cullen Bryant and William Lloyd Garrison thundering against slavery and defending the Union. Here, in 1860, Abraham Lincoln gave the powerful speech that is generally credited with earning him the nomination for the Presidency. Among the relatively early graduates of the art school were Augustus Saint-Gaudens, Adolph A. Weinman and Leo Friedlander; Thomas Edison and Supreme Court Justice Felix Frankfurter were students. In 1882 the library contained over 15,000 volumes; by 1932 the number had grown to 67,000 with another 17,000 in the more recent art library. 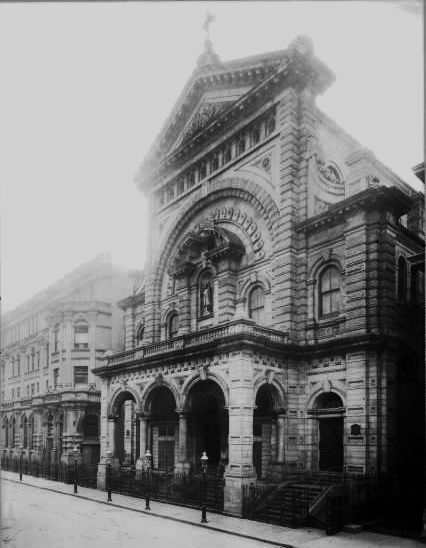 To cover the expenses, in addition to Cooper’s endowment and the rentals of the public spaces, donations flowed in from other wealthy New Yorkers such as Andrew Carnegie and Abram Hewitt. 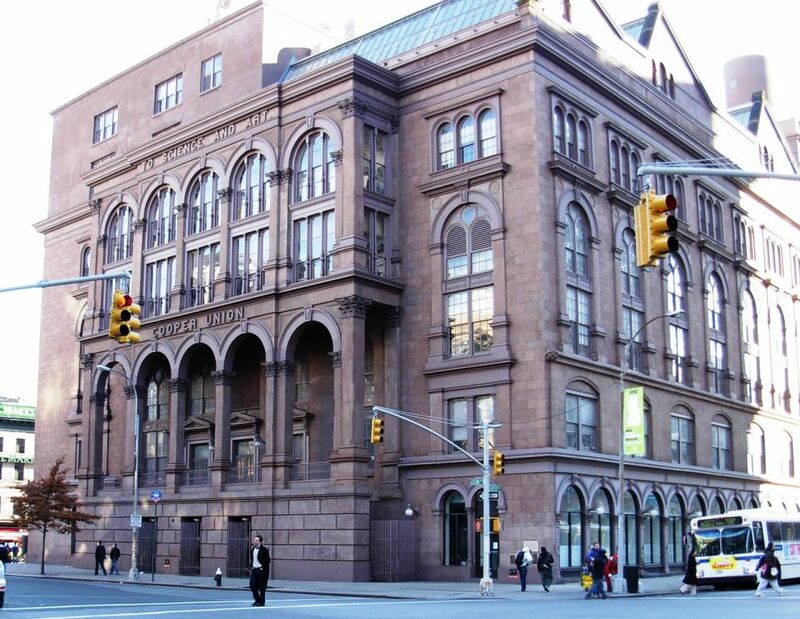 When Peter Cooper died in on April 12, 1883, he left $100,000 to the operation of Cooper Union. His legacy never faltered with his passing. Over the years Presidents Grant, Cleveland, Taft, Theodore Roosevelt, Wilson, Clinton and Obama would follow Lincoln’s lead, speaking in the Great Hall. Here the NAACP and the Red Cross were organized. Over a century and a half after Peter Cooper acted on his dream, the Cooper Union for the Advancement of Science and Art continues to provide full tuition for every student. 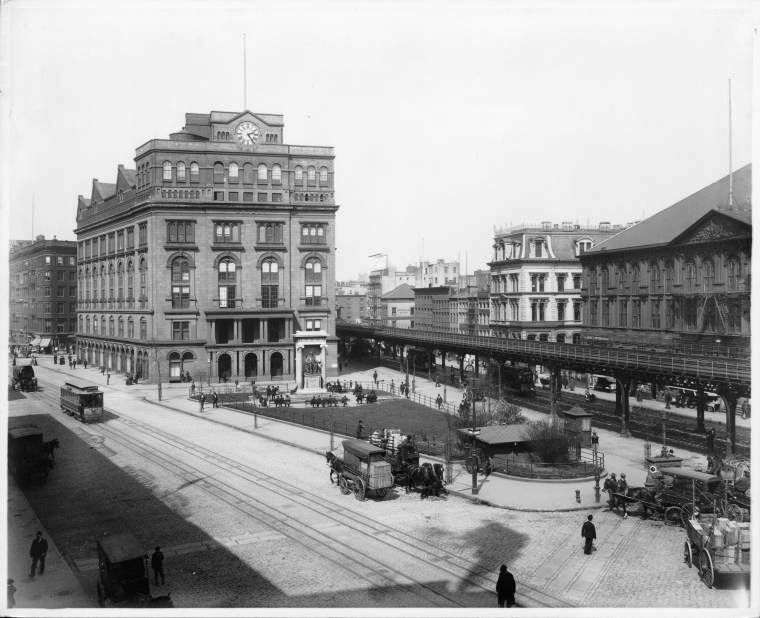 Broadway around Union Square was an exclusive shopping area in the early 1880s. Tiffany & Co., Lord and Taylor, A. T. Stewart and Arnold Constable had all moved their emporiums north from downtown in the 1870s. The exclusive silver merchants Gorham Manufacturing Company would follow suit. Robert and Ogden Goelet had inherited large plots of land along Broadway. Small commercial buildings filled the plots not yet taken over by the huge cast iron or marble-fronted dry goods stores. Two such buildings – a hardware store and a marble dealer – sat at the north west corner of Broadway and 19th Street. 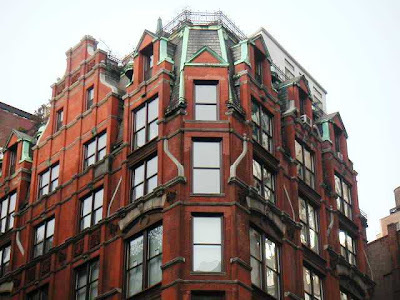 The Goelets commissioned architect Edward Hale Kendall, who had recently designed their Fifth Avenue mansions, to build a mixed-use structure on the site. Begun in 1883, his 8-story red brick Queen Anne-style building was trimmed with terra cotta, white stone, and copper flashings. Black slate shingles graced a modified mansard roof with cast iron cresting. Kendall's choice in Queen Anne was surprising on a thoroughfare lined with imposing French Second Empire retail stores; however the eccentric design and red brick stood out prominently among its neighbors. The first two floors of the building were designed for commercial use, while the upper floors were laid out as bachelor apartments, which had no kitchens nor dining rooms. By this time Tiffany & Co. had become the established itself as the hallmark of quality jewelry. And while the firm offered flatware, New York City’s carriage trade went to Gorham Manufacturing for its silver. When the Broadway building was completed in 1884, Gorham left its downtown location and took over the two lower floors. The company used innovative designs in its flatware and hollowware – Neo-Renaissance, Art-Nouveau and Aesthetic Movement trends, for example. King’s Handbook said the store offered “silver fashioned for every conceivable use.” And in Victorian New York, there was no end to "conceivable uses" for silver. A testiment to the firm's quality, it was announced in 1889 that Gorham Manufacturing would be one of four American silversmiths to represent the U.S. at the Paris Exhibition. 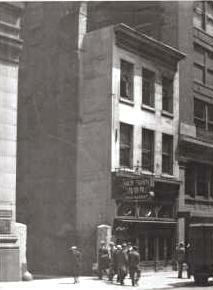 Joining in the migration of the exclusive shops to Fifth Avenue, Gorham left its Broadway corner on September 5, 1905. After a few years of various tenants, Robert Reis & Co., the men’s underwear manufacturer best known for its BVD brand, took over the lease in 1912. Architect John H. Duncan renovated the building, converting it into loft and office space. Two decades latter Reiss & Co. altered the building again to accommodate manufacturing on the upper floors. In 1977 the Gorham Building was extensively renovated for residential apartments on the upper floors and the street level was returned to commercial use and has been the familiar home to Fishs Eddy since then. The building was landmarked in 1984. Samuel Ruggles’ grand scheme to create Gramercy Park, a refined residential square, was well underway by 1845. A year earlier landscaping had begun in the elegantly-fenced park and the city’s elite had begun erecting dignified residences on the 60 plots around the square. 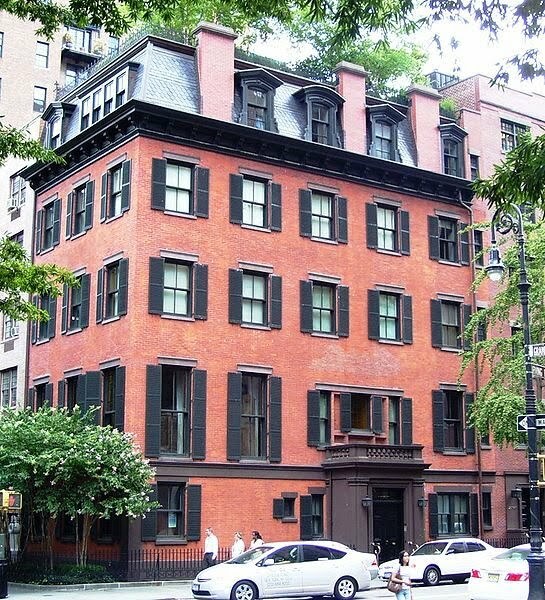 At 86 Irving Place, at the corner of Gramercy Park South, Whig politician William Samuel Johnson erected his comfortable four-story home in 1845. Five years later he sold it to socially prominent paper merchant Horace Brooks and his wife Mary Brooks. It was here in 1855 that the funeral of their 2 year old son, Horace Jr., was held. In 1866 Brooks updated the house with a fashionable black slate mansard roof with ornate iron cresting. The addition gave the restrained structure a dignified, Victorian flavor. A matching, mansarded stable was built to the south. Shortly thereafter it was owned by the eminent tobacco merchant Joseph Fatman who died in the house on October 11, 1869. 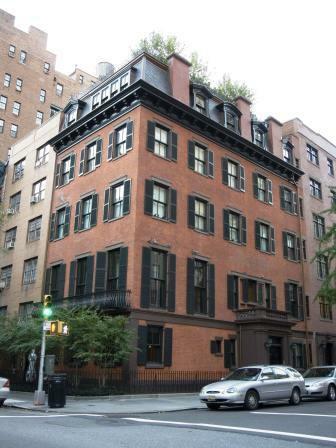 The large home had become a high-class rooming house by 1887 when Stuyvesant Fish purchased it. Fish, the president of the Illinois Central Railroad, was the son of former governor Hamilton Fish and a descendant of Peter Stuyvesant. His wife Marion (called Mamie by her friends) immediately began renovations. Her first priority was to change the address to the more socially-accepted 19 Gramercy Park South, despite the fact that the entrance was squarely on Irving Place. Although popular legend holds that Stanford White redesigned the home, documentation points more accurately to architect Sidney V. Stratton, a favorite of New York society at the time. Whichever designer was responsible, the results were spectacular. A curving marble staircase rose from the reception area to the upper floors. Here were classical elements, painted paneling and columns. On the top floor Mrs. Stuyvesant Fish installed her ballroom, where the cream of New York society would be lavishly entertained. The renovations cost a staggering $120,000. In 1898 the Fishes commissioned Stanford White to design a magnificent Italian palazzo at 78th Street and Madison Avenue, as they participated in the migration of millionaires northward. 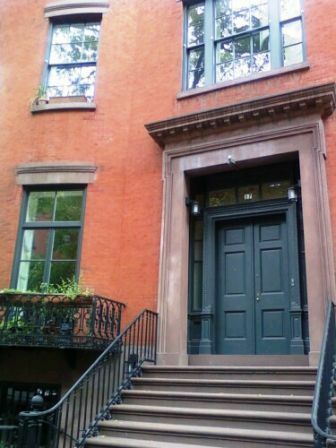 They retained the Gramercy Park home, leasing it to well-to-do merchant class families. On January 25, 1903, in honor of Mrs. Collier's grandmother, Mrs. Astor, the Colliers gave “their first large entertainment in the residence that belonged formerly to Stuyvesant Fish…It is to be a dinner, followed by a musicale, a very popular form just now of entertaining,” reported The New York Times. In 1909 an apartment building was added to the southern end where the stable had stood. The resulting complex was managed as a multiple – albeit high-end – dwelling. Over the years residents included portrait artist Cecilia Beaux, actor John Barrymore, David Lamar, the "Wolf of Wall Street," Edward Sheldon, the playwright, and William C Bullitt, ambassador to France in 1939 and, in 1944, Norman Thomas, the Socialist Party candidate for President. High-profile publicist Benjamin Sonnenberg and his wife leased two full floors in 1931, quickly falling in love with the house. 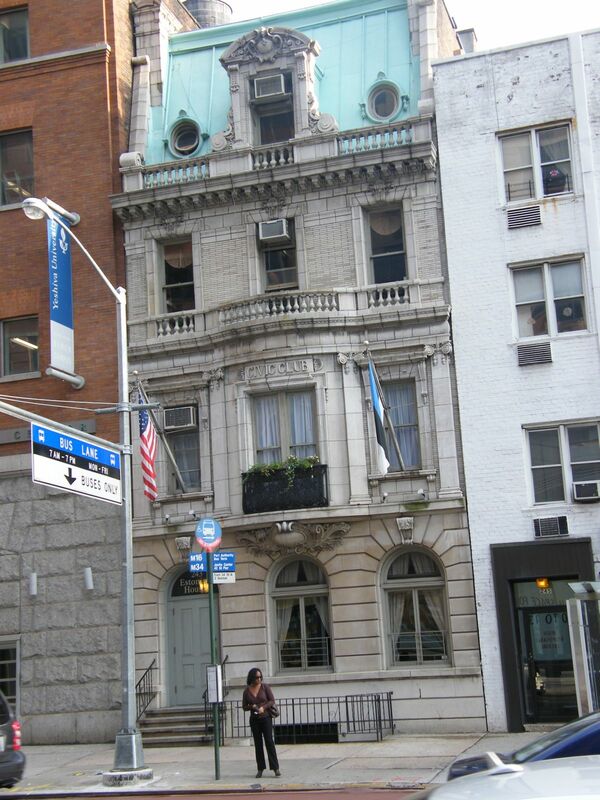 In 1945 the couple purchased the building from Stuyvesant Fish’s son for $85,000, moved into the Waldorf-Astoria, and quickly re-converted it to a private residence, joining the original house with the apartment building. The Sonnenberg’s furnished the resulting 37-room mansion with English antiques and paintings by Renoir, Seurat, Gauguin, Goya, Tintoretto and Cezanne. Seventeenth Century English paneling from Streatlam Castle in England was installed in a second story drawing room, which became known as The William & Mary Room. 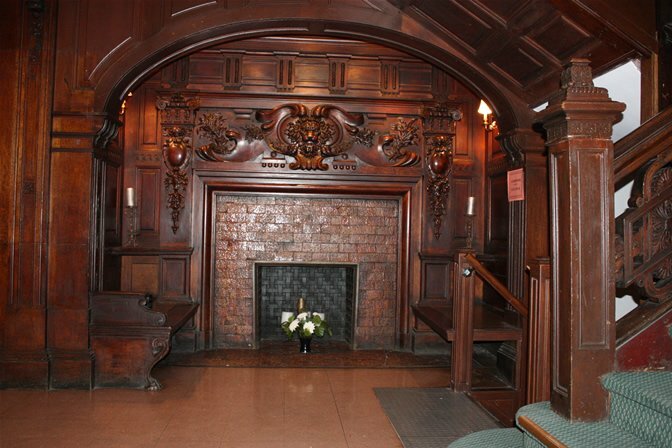 There were 13 fireplaces, six bedroom suites and, of course, Mamie Fish’s dramatic ballroom. With the arrival of the Sonnenbergs, the house again saw lavish entertainment on par with that of Mrs. Stuyvesant Fish with 150 guests for dinner. According to one friend, Sonnenberg “always thought the ideal dinner party should have one actress, one businessman, one artist, and one banker.” The guest list of a 1967 dinner party included Brooke Astor, Bob Dylan, Jacob Javits, Jackie Kennedy, Alistair Cooke, Tom Wolfe, Truman Capote and Ethel Kennedy. The house was purchased for $1.5 cash by Baron Walter Langer von Langendorff, the creator of White Shoulders perfume. Peculiarly, the baron and his wife staffed the house but did not move in. For years it sat, essentially empty, the private residence of servants. Finally in 1981 the baron entreated Jane Ashley to take up residence and start redecorating. 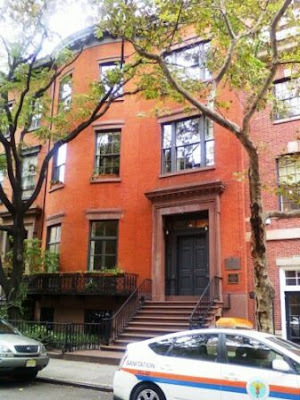 Two years later, however, the owner of 19 Gramercy Park South died, leaving an estate of approximately $125 million. Jane Ashley continued to live in the house another seven years before it was put on the market for $10 million. The house, which critic Brendan Gill had once called “the greatest private house remaining in private hands in New York,” was simply too large. Entertainment on the scale of the Fishes and the Sonnenbergs no longer existed. In 1995 the property was sold to fashion designer Richard Tyler and his wife, Lisa Trafficante, for $3.5 million. Mrs. Stuyvesant Fish’s glorious ballroom was renovated into a “white space” for fashion shows. By January 2000 the 18,000 square foot home was on the market again, selling in December for $16.5 million to psychologist Dr. Henry Jarecki. No. 19 Gramercy Park has one of the most varied and colorful histories of New York residences; a dignified reminder of the Park’s rich heritage. Native-born New Yorker George T. Delacorte started in business in the 1920s. His firm, Dell Press, published comic books, paperback novels and movie magazines. By the 1950s he was a millionaire with, he felt, more money than he needed. When his beloved wife, Margarita, died, he sought a way to express his profound grief as well as to memorialize her. The publisher spent Sunday mornings in Central Park, often stopping to sit and watch the children play. Margarita Delacorte had been an ardent Lewis Carroll reader, her favorite poem being “Jabberwocky.” It became his inspiration. 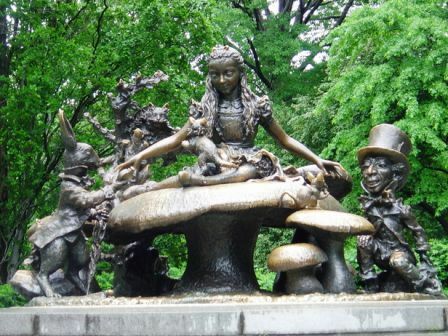 Delacorte commissioned Spanish-born sculptor Jose de Creeft to design an enormous bronze statue of Alice in Wonderland, based on the Victorian illustrations by Sir John Tenniel. Creeft worked closely with architect and designer Hideo Sasaki and Fernando Texidor, who designed the base. They incorporated bronze plaques with inscriptions from the Carroll’s book, including Margarita's cherished "Jabberwocky." On May 29, 1959 Parks Commissioner Robert Moses unveiled the 11-foot high statue, officially called The Margarita Delacorte Memorial. Cast in Long Island City, Queens, by Modern Art Foundry of Long Island City, the complex grouping features Alice sitting on an enormous mushroom. Around her are the March Hare with his iconic pocket watch, a smug-looking Mad Hatter, the Dormouse nibbling on a seed, and the Cheshire Cat. Unlike any other sculpture in Central Park, it was expressly designed to be touched, climbed upon and generally enjoyed. It was immediately became a favorite among the children. “It just seemed a nice thing to have in the park. On Sunday mornings I watch the kids climbing over it, under it. It’s a regular parade,” Delacorte said. While the children never noticed their dapperly-dressed benefactor, he realized the joy his gift brought to so many. The Alice statue would be just the first of many gifts to the people of New York. Before long the fantastic, mechanical Delacorte Clock at the Children’s Zoo was installed. Then a fountain at Columbus Circle. Then another at City Hall. The New York Times and other organizations were not so quick to praise. They felt Delacorte’s choice of philanthropies were well-intentioned but misdirected. The money could be put to better use, it was thought, for institutions like hospitals or drug rehabilitation centers. His fountains and statues had no practical purpose. Few New Yorkers today, especially the swarms of children who climb over the bronze mushroom, agree with the pragmatic critics of the 1960s. The Alice statue was central to scenes in the 2010 film Remember Me as the spot where Tyler and his sister Caroline meet. 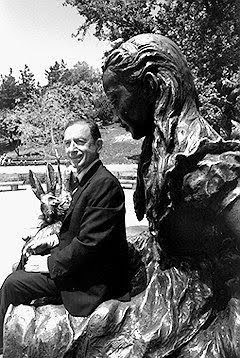 Today the Alice in Wonderland statue continues to be so popular with children – their hands and feet continually polishing the surface – that Central Park spends over $10,000 every year on its maintenance. It is located inside the Park at East 74th Street. 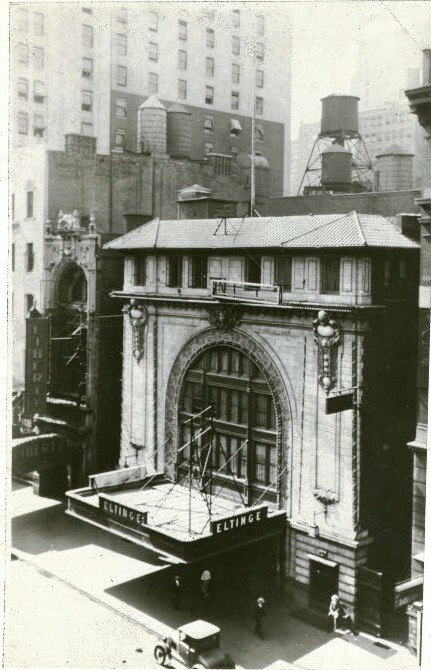 The new theatre opened on September 11, 1912. Its restrained Beaux Arts, white terra cotta façade was dominated by an immense arched window, several stories high. 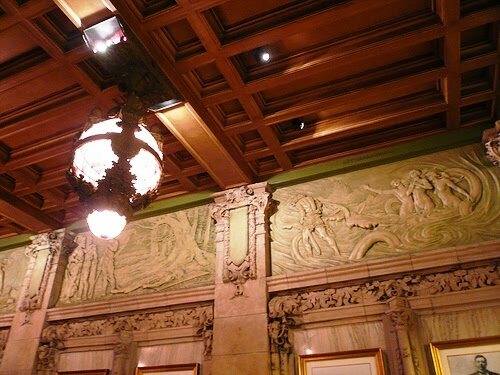 Inside, a mural by French artist Arthur Brounet adorned the lobby. The auditorium was decorated in an Egyptian theme, which both pleased and displeased the critics of the day. The opening production, Within the Law, starred Jane Cowl. Despite the pedantic warnings of The New York Times theatre critic, it ran for 541 performances. The Eltinge was a small theatre, having only 759 seats, but it presented the greatest names in the theatre. Two years after its opening John Barrymore starred in The Yellow Ticket. In 1929 Laurience Olivier made his American debut in Murder on the Second Floor and in 1930 Love, Honor and Betray opened with Clark Gable and Alice Brady. Not everything went smoothly for The Eltinge and Al Woods during this time, however. The "average American” reading the account as published in The New York Times was irate. On November 22, 1921 Police Commissioner Gilchrist order the theatre to be shut down, calling the play The Demi-Virgin “indecent.” A highly-publicized media battle between Gilchrist and Woods ensued; Woods refusing to shut down, saying that the police commissioner had the right, by law, to shut down a motion picture but not a play. The manager distributed pink slips of paper to the audience asking their opinion as to whether the play was indecent or not. In the end, Woods won the battle after about a week of arbitration and the play never faltered. Rudnick’s idea of entertainment was far removed from the legitimate theatre produced by Woods. 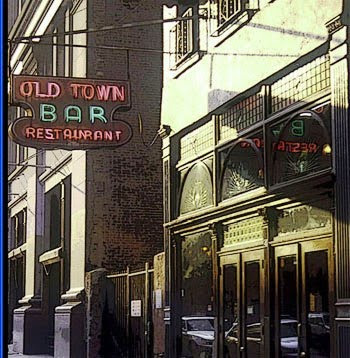 Although some of the acts were tame – Jackie Gleason got his start here and in 1935 Bud Abbot and Lou Costello met doing separate acts – the strippers went too far as far as local politicians were concerned. On November 17, 1934 seven female performers, along with the manager and assistant manager, were arrested during intermission, charged with indecent performance. 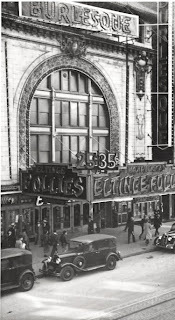 Mayor Fiorello LaGuardia, bent on closing all the burlesque houses, finally closed down the Eltinge in 1937, along with fourteen other such theatres that same day. After being boarded shut for five years, the Eltinge was converted to a movie theatre, opening in 1942 as Laffmovie, a first-run movie house. By 1954 the 42nd Street neighborhood had declined. 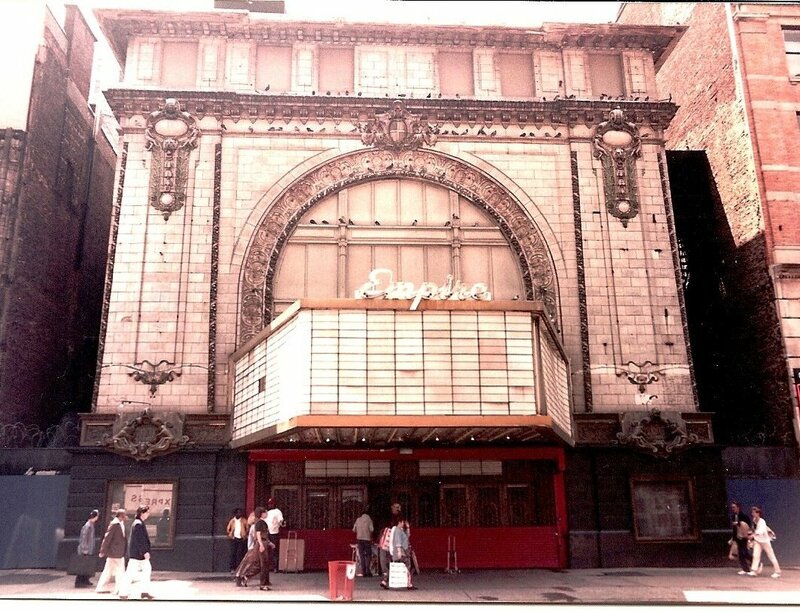 The theatre was renamed The Empire, a “second-run grind house” screening grainy pornographic movies. By mid-1980s the seedy neighborhood made survival impossible and the theatre was closed for good. 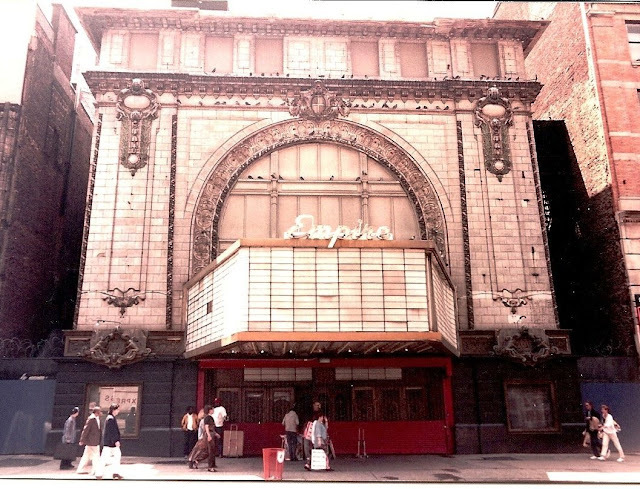 In 1992, the exterior of the vacant Empire was used in the filming of Columbia Picture's Last Action Hero starring Arnold Schwarzenegger. Things began improving for 42nd Street in the mid-1990s with the Times Square Redevelopment Plan. Tax breaks and assistance from the city encouraged concerns like Disney to invest heavily in the renovation and restoration of historic Times Square properties. Where the Empire sat deteriorating, developers Forest City Ratner envisioned a colossal 335,000 square foot entertainment and retail complex. Plans were drawn up, proposals discussed, and the concept took shape. The Empire sat, problematically, squarely in the center of the site of the $160 million project. Developer Bruce Ratner had a choice to make. 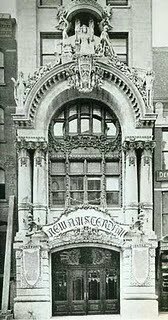 His firm had already decided to preserve the Empire rather than demolish it, using the façade as the western entrance – down the street from where the theatre sat. The terra cotta façade could be dismantled and reconstructed, or for about the same cost he could move the entire structure. Ratner chose to move it. The cost to move the theatre was $1.2 million. Today the historic façade is essentially intact behind a new neon marquee. Inside Brounet’s mural has been restored by Harriet Irgana, director of Rustin Levenson Art Conservation. While the old Eltinge had 759 seats, the AMC Empire boasts 4,916 seats in 25 auditoriums. 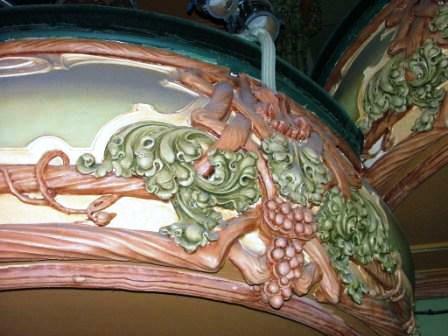 Part of the proscenium of the old Eltinge remains, a reminder of the glorious days of the theatre a century ago. And so William Rhinelander continued in the real estate business well past his death. 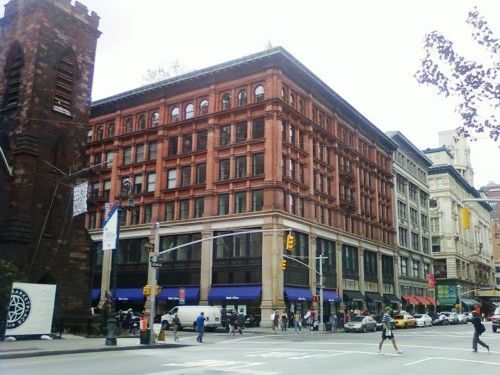 In 1892 his estate built a handsome retail and office building on the southeast corner of 6th Avenue and 20th Street. Other high-end emporiums had already begun appearing along what would be known as the Ladies' Mile. 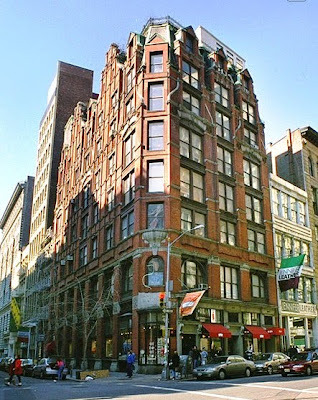 Where eight four-story brick homes had stood, architects Hubert, Piersson & Hoddick produced a six-story, red brick Neo-Renaissance building with white stone and terra cotta trim, Corinthian colonnettes, a heavy copper cornice and elegant iron balconies. The structure was leased to Alfred J. Cammeyer, the foremost shoe vendor in the city. 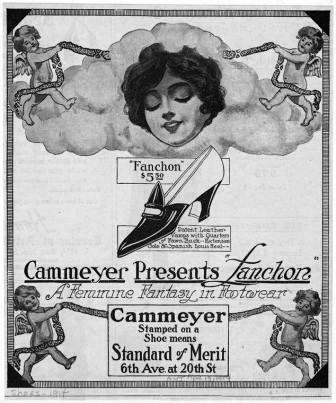 Born in 1840, Cammeyer started in the business at the age of 15, working as a clerk in a shoe store. As he learned the business, he saved enough money to open a store of his own at Bleecker and Carmine Streets in 1876. 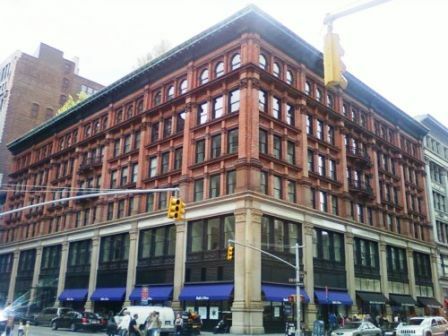 By the time the Rhinelander building was being constructed he occupied a much larger shop at 6th Avenue and 12th Street. 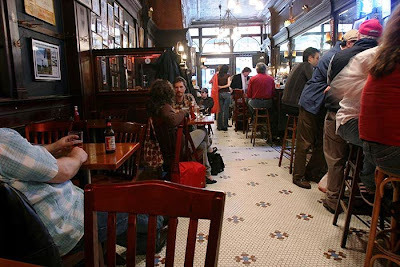 On September 29, 1893 The New York Times reported that Cammeyer’s “spacious premises proved unequal to the demands upon them” and the store would be moving to the building at 6th Avenue and 20th Street. The new building, said The Times, “constructed in massive and dignified style is, architecturally speaking, a welcome addition and ornament to Sixth Avenue…and is probably the largest and best equipped boot and shoe establishment in this country, if not the world. On the night of January 18, 1899 that all nearly came to an end. Officer Reid instructed the woman to hurry outside, but when they entered the hall and Mrs. Lynett saw the smoke, she fainted. “Reid made a gallant rescue by carrying the woman to the street where she was resuscitated,” said The Times. The substantial brick and stone building, however, was not seriously damaged and on March 6 the store reopened. Cammeyer stocked 25,000 souvenir tape measures for re-opening day, but they ran out before closing time. Hundreds of customers lined 6th Avenue all day waiting to get in. It was necessary for Alfred Cammeyer to increase his sales staff to 600. A crowd of deal-hungry shoppers, Cammeyer’s would find out in 1903, was not always a good thing. On Feburary 10 the store promoted a “bargain counter.” Sixty-year old Mrs. Olonzo A. Emery traveled in from Sommerville, New Jersey for the event. As she was about to be waited on, the crush of other women around her became too much. She “uttered a cry” then fell to the floor. By the time the store’s physician, Dr. Schfeldt, could attend to her she was dead. On August 14, 1909 Alfred Cammeyer died “of apoplexy” at 69 years old. The man who started out as an impoverished Yiddish-speaking teenager ended life in a mansion on Central Park West and 72nd Street, the owner of the largest shoe store in the country. His funeral was conducted at The Church of the Holy Communion – across the street from his beloved store. As the great stores gradually moved away from 6th Avenue, following Macy’s and Benjamin Altman’s northward past 34th Street, Hart followed. 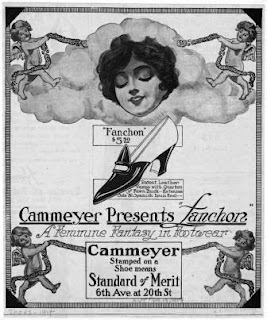 In 1914 Cammeyer’s Shoes moved to 381 Fifth Avenue. It was the end of the opulent days for the building at 6th Avenue and 20th Streets. The grand shoe store was divided into small retail spaces, then office space. In 1937 the interior walls between the Cammeyer Building and the Alexander Building to the south were broken through, joining the two buildings. Eventually the space was taken over by the Audits and Surveys offices and drab governmental work spaces filled the building for decades. The once-exclusive Ladies Mile deteriorated and most of its imposing retail palaces sat empty and dark. The farmland that John Cowman had purchased in 1825 was, by the time his will was executed in 1842, still undeveloped and rural; although Fifth and Sixth Avenues had been newly extended through the area. Cowman’s widowed son-in-law, Edward Sebring Mesier received half of the property. Mesier, a partner in the firm Mesier & Rich, book publishers and stationery merchants, came from a long line of New York retailers extending back to the 18th Century. 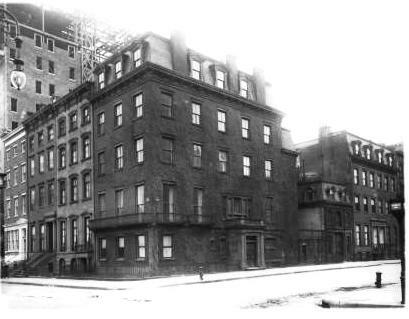 Edward Mesier’s inherited land was divided into lots on the north side of West 16th Street – Nos. 1 through 21. In 1845 Mesier began talks with several prospective property owners and a restrictive agreement was recorded. Accordingly, buildings erected on the lots were to be “at least six feet back from the street” and no “stable, meat shop, slaughter house…or any base commercial establishment” would be permitted. The block was to be one of “first-class” homes. George S. Fox purchased No. 17 in April of the next year. The row of Greek Revival residences that included No. 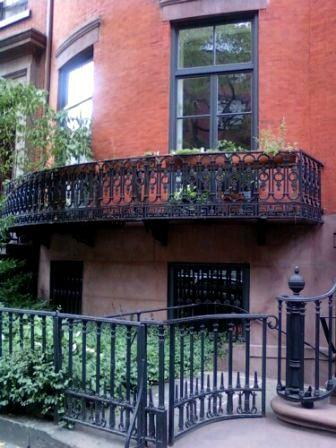 17 were three stories high above a brownstone English basement. 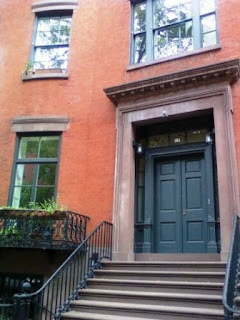 Brownstone trims, including the door surround, window sills and lintels, and the broad entrance steps, contrasted handsomely with the red brick. An elegant cast iron balcony hugged the parlor level. The curved bowfront of No. 17, along with those of its neighbors Nos. 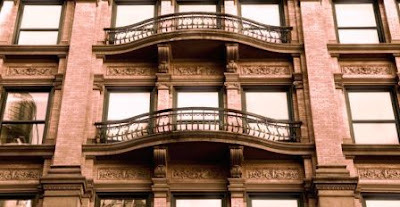 21 and 23, was a popular and common architectural touch in cities like Boston, but extremely rare in New York. The entrance was slightly recessed, with a paneled double-door with sidelights and overlight. Inside, the finest furniture from the workshops of mid-century New York cabinetmakers adorned the parlor, dining room and bedrooms. In 1876, wealthy merchant William B. Rice and his wife Gertrude Stevens Rice purchased the home. The Rices were active in New York social circles and spent their summers at their Bar Harbor, Maine estate, The Tides. In November of 1888 Mrs. Rice was appointed Commissioner of Common Schools by Mayor Hewitt. After William Rice died in 1899, Gertrude Rice secluded herself at No. 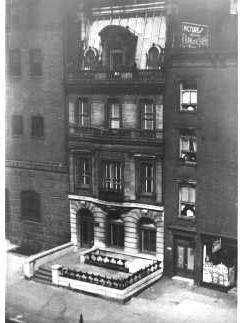 17 West 16th Street for a year, renting The Tides out to A. Butler Duncan for the summer of 1900. She thereafter devoted herself to charitable works, most specifically the State Charities Aid Association, when not spending her summer months in Maine. 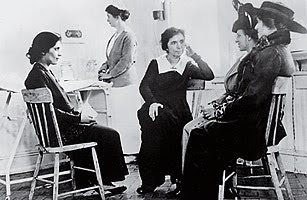 In the meantime, Margaret Higgins Sanger was a nurse in Manhattan’s impoverished Lower East Side. Sanger was horrified by the infant mortality rate she witnessed and in 1912 abandoned her career to advocate for birth control. She wrote and published a series of articles on sexually-transmitted diseases and contraception. The articles were considered obscene by the United States Government and were, therefore, illegal to mail under the restraints of the Comstock Act. Margaret Sanger fled the country to avoid prosecution in 1914. Seven years later the clinic had outgrown its space and Margaret Sanger’s husband, oil industrialist J. Noah H. Slee, purchased the house at 17 West 16th Street for the clinic's use. The Birth Control Clinical Research Bureau moved into the house in 1930, expanding its services. Doctors nationwide came to the clinic to learn the latest contraceptive techniques (few medical colleges taught birth control) and social workers kept in contact with the women who sought assistance. Within a few years the Bureau was serving over 10,000 patients a year, providing contraceptive instruction for couples and married women, and gynecological services. Margaret Sanger died in 1966, however the Bureau continued to work out of the house until 1973. 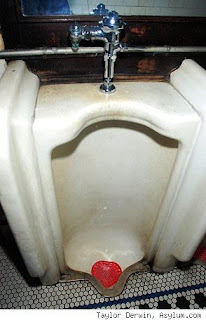 Although the National Park Service recommended national landmark designation, the nomination was held up by the first Bush Administration which felt that Sanger’s involvement in birth control would be equated with the abortion movement. The nomination sat, unsigned, on the desk of the Secretary of the Interior for years. Upon Bill Clinton’s election, Secretary of the Interior Bruce Babbitt signed the forms and in 1993 the Sanger Clinic was designed a National Historic Landmark. Today No. 17 West 16th Street is privately owned and beautifully restored. In the first days of the 20th Century New York architects were recreating Roman temples, Renaissance palazzos and Romanesque castles. At the same time Paris turned its back on the past and embraced the innovative Art Nouveau style introduced at the 1900 Paris Exposition. Sinuous Metro station entrances and floral apartment buildings and retail stores seemed to sprout from the pavement like vines. Architects Henry B. Herts and Hugh Tallant thought differently. 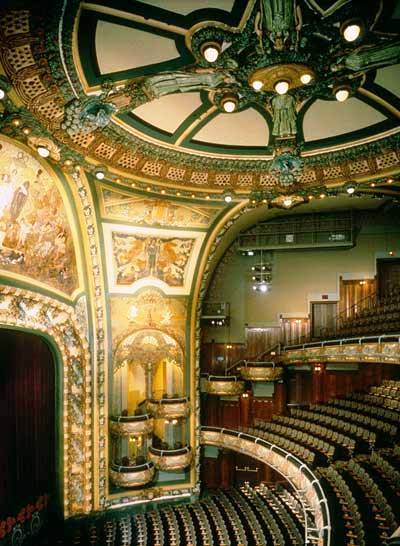 When Abraham Erlanger and Marc Klaw chose 42nd Street for a new theatre in 1902 as the entertainment district moved uptown from 23rd Street, they commissioned Herts and Tallant to design it. What the architects produced was like nothing seen before in the country. Eventually the mayor and the theatre owners got their way and the installation of the remarkable arch proceeded. Sculptor George Gray Barnard perched a grouping of Drama, Pierrot, Cupid, a Knight and a Lady, surrounded by wreathed flowers, scrolls and garlands. The arch was supported by columns of yellow marble with bronze capitals. Herts and Tallant used an innovative cantilever construction that allowed the balconies to hang over the main floor with no visible means of support – giving unobstructed views from all seats in the house. The pod-like boxes on either side of the stage, also designed by Issing, were each given a separate flower motif such as lily, buttercup, violet, and goldenrod. 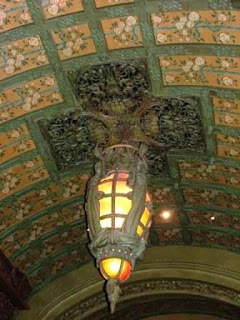 In the lobby, beneath an art glass dome, was a fireplace of Irish marble and Caen stone, two murals by George Peixotto of “Inspiration” and “Creation,” marble wall fountains with brilliant mosaics, and bronze busts of dramatists. 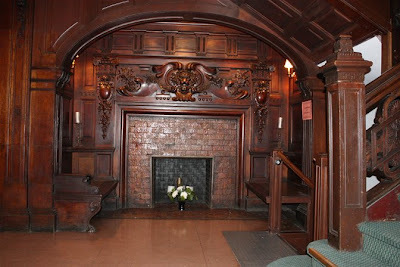 The men’s lounge, “The Amsterdam Room,” was decorated with a continuous mural by Edward Simmons, George Peixotto and R. W. Finn depicting the history of New York. 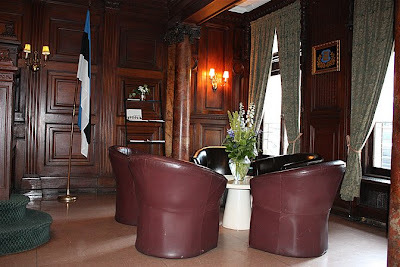 Masculine oak and leather furniture rested on a terra-cotta tiled floor. The ladies’ lounge was outfitted in satinwood furniture under a ceiling fresco depicting classical figures. James Traub in his “The Devil’s Playground: A Century of Pleasure and Profit in Times Square” said “The sinuous line and stripped-down ornamentation of art nouveau was the very look of modernity for the forward-thinking aesthetes of the early years of the century, and the New Amsterdam was considered a building of the first importance—a building that might well 'mark an epoch in the history of art,' as one penetrating if breathless account put it. This was also, of course, an era of opulence and show, and the New Amsterdam was intended to dazzle even the most blasé theater-goer." The architects stressed while designing the building that they wanted to elicit the magic quality of A Midsummer Night’s Dream. Appropriately, the opening play on October 25, 1902 was, indeed, A Midsummer Night’s Dream. An architecture critic present on opening night called it “the most airy, fairy beautiful thing in the way of a playhouse that the New York public has ever seen.” On the roof a second, enclosed theatre offered entertainment in the summer months. The road ahead for the theater would not always be smooth. A complaint by the Health Board nearly closed the theatre on March 21, 1907, when police stopped ticket sales. Curtains that had been hung over the exit doors as decoration were deemed a fire hazard by the Board. Joseph Brooks, one of the owners, called the action “uncalled for.” “They closed us up tight and turned away hundreds of persons…There’s not the slightest doubt that there’s something back of the whole thing, but I don’t know what it is.” Whatever “it” was, the theatre was back in operation a day later after removing the curtains. In 1908 The New Amsterdam was enjoying a smash hit with The Merry Widow. To celebrate the 275th performance, the management announced it would give away “Merry Widow hats” as souvenirs to all the women in orchestra and balcony seats during the matinee. Between the second and third acts, however, the women rioted when a rumor broke out that hats were being given away early. The worst problem came in 1930 when the play “Vanities” was raided by police and nine of the cast members were arrested for “giving an indecent performance.” The theatre was reopened when the scene that the police censors found objectionable was removed. Between the hat riot and the police raid, Florenz Ziegfeld moved his famous Follies from the Moulin Rouge. The Follies presented an annual review at The New Amsterdam until 1927 when Ziegfeld opened his own Ziegfeld Theatre. 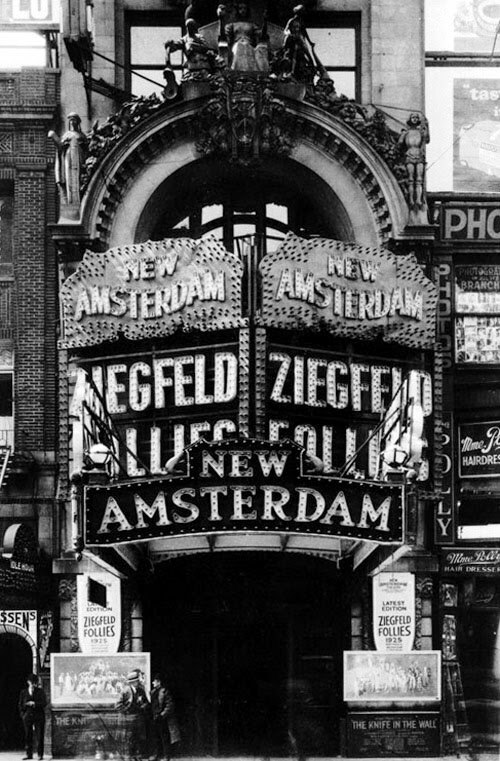 Through the Follies The New Amsterdam hosted stars like Bert Williams, Fanny Brice, Will Rogers, W. C. Fields, Eddie Cantor and Marion Davies. The Great Depression hit the theatre district hard. At the beginning of 1931, Variety reported that 31 theatres had closed. The rooftop theatre became NBC Times Square Studio, a radio studio and feature film studio. Despite its valiant struggles, the theatre was unable to keep afloat. On May 7, 1936 the Dry Dock Savings Institution foreclosed citing $1.6 million inpaid interest and taxes. Max Cohen purchased The New Amsterdam for $500,000 to convert the theatre to a movie house. The elaborate Beaux Arts entrance arch was stripped off to accomodate a sleek Art Deco neon sign. The movie theatre opened in 1937 ironically screening A Midsummer Night’s Dream. The rooftop theatre became the NBC Times Square Television Theatre in 1951; but as 42nd Street degraded, so did the New Amsterdam. 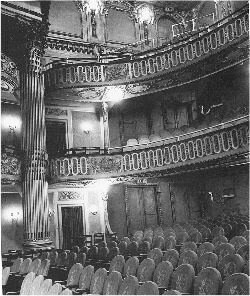 In the early 1980s the once-magnificent theatre was boarded shut. Although the Nederlanders bought the building for $5 million in 1982, a string of problems prevented its renovation. 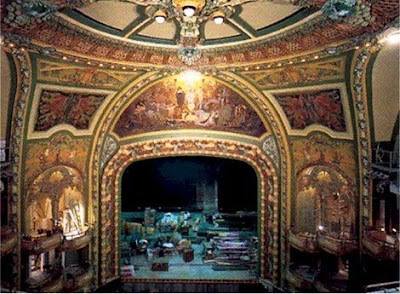 The theatre sat abandoned for a decade while its lavish interiors deteriorated. Finally New York City and State pushed for the resurrection of the 42nd Street Theatre District. The 42nd Street Development Project took over the building in 1992 for $247,000. 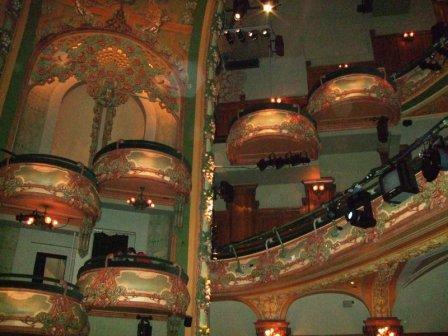 The architectural firm of Hardy Holzman Pfeiffer, known for rejuvenating historic properties, was hired to stabilize the theatre. Water was pumped from the basement, the spread of mold and loss of decorative plasterwork was halted, and the building was ridded of vermin and vagrants. In 1995 the Walt Disney Company formed the New Amsterdam Development Corporation to renovate the building as a live theatre venue once again, using partial financing from tax incentives offered by the National Park Service. The renovation, lasting a year and a half, cost $36 million. The New Amsterdam officially reopened as a live theatre on April 2, 1997 with a concert staging of King David, followed later that year by the long-running stage version of The Lion King. Today the sumptuous façade of The New Amsterdam is gone. However, to enter the theatre is to step back to 1903. The sinuous, entwining designs are fresh and renewed. 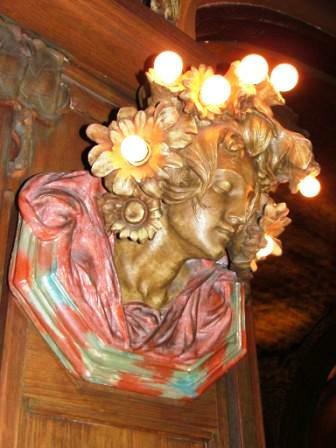 One of the greatest Art Nouveau interiors in the country -- and a true rarity in New York City -- has been salvaged from nearly inevitable destruction.